Railpictures.ca - Mike Molnar Photo: CN A438 rounds the curve that ties the CASO Spur into the Pelton Spur. Pelton at one time was a diamond between the CASO Subdivision and the C&O Sub 1. After CSX left the area, CN took the section of Sub 1 between Pelton and Walkerville Junction, renamed it the Pelton Spur, and built a seamless connection between it and the CASO via a wide sweeping curve. Today, there is not a whole lot left of Pelton. No trains actually pass the spot where the CASO and Sub 1 crossed each other as the curve CN built starts further west at Walker Road. | Railpictures.ca – Canadian Railway Photography – photographie ferroviaire Canadienne. 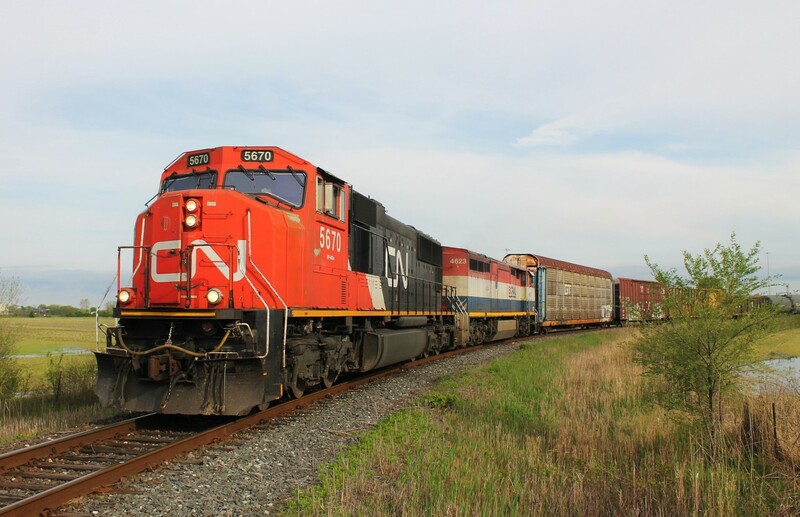 Caption: CN A438 rounds the curve that ties the CASO Spur into the Pelton Spur. Pelton at one time was a diamond between the CASO Subdivision and the C&O Sub 1. After CSX left the area, CN took the section of Sub 1 between Pelton and Walkerville Junction, renamed it the Pelton Spur, and built a seamless connection between it and the CASO via a wide sweeping curve. Today, there is not a whole lot left of Pelton. No trains actually pass the spot where the CASO and Sub 1 crossed each other as the curve CN built starts further west at Walker Road.